Our WaxMaster snowboard scrapers and ski scrapers are made in the USA to precision standards are the best quality you can find! These are solid stainless steel that will not rust, bend, or break. These are solid 304 grade stainless steel that is hand polished. It has a 3mm thickness which is the same as the plastic Burton scrapers. 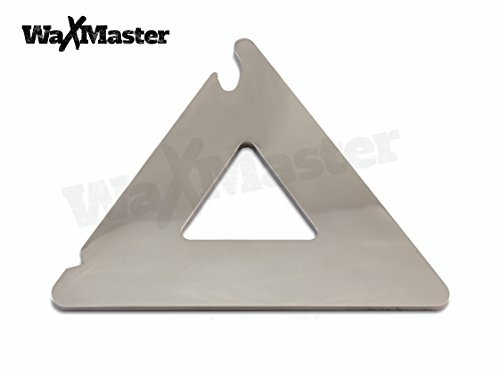 This multi tool triangle has perfectly square and flat sides and edges to get an even consistent scrape every time. Smooth rounded corners so you will not gouge your board. Triangle cut-out for hanging at your shop or on a lanyard. Includes a 90° degree notch to clean excess wax off the edge of your board, and a built-in bottle opener to use on the slopes. This is the larger 5" tri intended for snowboard use. The other size is 3" for use on ski's. 3-in-1 Mulit Tool: Wax Scraper, Edge Scraper, and Bottle Opener All-in-One! Solid stainless steel will not rust, bend, or break! Will last forever! If you have any questions about this product by WaxMaster, contact us by completing and submitting the form below. If you are looking for a specif part number, please include it with your message.